WASHINGTON (CNN) -- Anti-war lawmakers Thursday called on colleagues in the House of Representatives to set a "clear timeline" for an immediate U.S. withdrawal from Iraq, challenging fellow Democrats to assume the political risk of ending the war. In a press conference, members of the Congressional Progressive Caucus and the Out of Iraq Caucus proposed legislation that would require Congress fully to fund the safe and secure withdrawal of U.S. troops from Iraq by December 31, 2007. "Four and half years ago the president asked to give war a chance, and despite our objections he got that chance and he blew it," said Rep. Janice Schakowsky, D-Illinois. "No more chances. No more waivers. No phony certifications. No more spending billions of dollars to send our children into the meat grinder that is Iraq. It is time to spend the money to keep them safe and bring them home." The leadership's proposal is meant to bridge a divide among Democrats on how the party should address the war. A growing number of Democratic House members are refusing to vote for more war spending, while more conservative members from states that have supported Bush worry that putting conditions on military funds could tie the hands of U.S. commanders on the ground. The leadership proposal may not satisfy lawmakers who want an immediate withdrawal. "[The leadership's] plan would require us to believe whatever the president would tell us about progress that was being made," said Rep. Maxine Waters, D-California. "This is same president that led us into a war with false information, [said there] no weapons of mass destruction, said we would be [welcome] with open arms, said that the mission had been accomplished. Now we expect him to give us a progress report in their plan by July?" she asked of the proposed measure from House Speaker Nancy Pelosi, D-California. "We want a simple plan. We want a plan that will fund the safe and secure exit of our troops from Iraq in a reasonable period of time and that's not asking too much," Waters said. In a letter sent to House colleagues Wednesday, the Out of Iraq Caucus accused the Bush administration of playing a game of "chicken" with the war, "where whoever acts to bring a responsible end to their failed policy will be accused of having lost Iraq." "There is no question that moving to stop this folly carries a political risk -- the accusation that Democrats gave up on the Vietnam War, despite all evidence that it was an unwinnable conflict, hurt the party's credibility on national security issues for a generation," the lawmakers wrote. But they argue the costs of the war have become "unsustainable," damaging efforts to battle terrorism and costing more than $8 billion a month. "The longer we allow the administration to delay meaningful movement, and the longer we fail to extract ourselves from this quagmire, the more dangerous this failed foreign policy becomes to America and the rest of the world," the lawmakers said. The caucus claims to include about 75 House members -- nearly a third of the Democratic majority. The signers of Wednesday's letter included Reps. Barbara Lee, Lynn Woolsey, Sam Farr and Waters of California; and Reps. Jerrold Nadler and Maurice Hinchey of New York. Support for the war has fallen sharply in the past two years, with published polls indicating about twice as many Americans oppose Bush's handling of the war as support it. But since assuming control of Congress in January with what leaders called a mandate to change course in Iraq, Democrats have struggled to craft acceptable, binding legislation to force the administration to bring U.S. troops home. Anticipating Republican accusations that its members want Congress to micromanage the military, the Out of Iraq Caucus said its proposal is "macromanagement." And it argues the move would force GOP representatives to defend their support for the ongoing conflict, "which is a debate that Democrats win every time." The House passed a nonbinding resolution opposing Bush's deployment of more than 21,000 additional troops to Iraq in February. Seventeen Republicans joined Democrats in supporting that resolution. Measures rebuking the president on the war face a tougher battle in the Senate. Democrats in that body failed to garner the 60 votes they needed to consider a nonbinding resolution opposing Bush's troop increase. The vote was 56-34, with seven Republicans crossing the aisle to vote with senators who oppose the troop buildup. 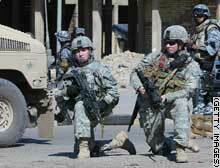 U.S. soldiers with the 82nd Airborne Divison take combat positions during house searches this week in Baghdad.